1 Unidad de Biodiversidad Acuática, Centro Nacional del Medio Ambiente (CENMA), Universidad de Chile, Santiago, Chile. 2 Universidad Andrés Bello, Facultad de Ciencias Biológicas, República 252, Santiago, Chile. Although alcohol is known to be a carcinogen for humans, ethanol-genotoxicity studies are incomplete. Ethanol seems not to be a bacterial mutagen, but the results are conflicting in rodent assays. We investigate the genotoxicity in the bone marrow micronucleus (MN) test and in the dominant lethal mutation (DLM) assay using two long-term ethanol exposure protocols. In the MN test, mice consumed three doses (5, 10 and 15% v/v) for 32 weeks. MN induction was compared to two control groups of 5- and 38-week-old mice (the ages of the treated mice when the treatment was initiated and when they were killed, respectively). For the three groups treated with ethanol there was no significant increase in MN induction as compared to the first control group, but observed MN frequencies were significantly lower than in the 38-week-old control group. This suggests a protective effect against genotoxic damage caused by aging, probably due to ethanol action as a hydroxyl radical scavenger. In the DLM assay, male mice drank ethanol at 15% or 30% (v/v) for 20 weeks. In both groups the number of dead implants was similar to the control, but there was a significant reduction in total implants, indicating a pre-implantation loss. Chronic alcoholism is a mayor public health issue around the world. Consumption of alcohol has been related to cardiovascular diseases (Friedman, 1998), hepatic effects (Lieber, 1985), brain toxicity (Harper, 1998), and increased incidence of esophagus, larynx and oral cavity cancers. The International Agency for Research on Cancer (IARC, 1998) has found that there is sufficient evidence for the carcinogenicity of alcoholic beverages in humans, and has classified alcoholic beverages as Group I carcinogens, although the mechanism of ethanol carcinogenicity is still not known (Kayani and Parry, 2010). There are many studies about the genotoxic potential of ethanol, some of which have shown chromosomal effects in lymphocytes of alcoholics, like sister chromatid exchanges (reviewed in Obe and Anderson, 1987), induction of chromosomal aberrations (López et al., 2001) and increased incidence of aneuploidy (Kucheira et al., 1986), suggesting that alcoholism may cause chromosome damage in humans. The genotoxicity testing of ethanol was first reviewed by an expert group of the International Commission for the Protection against Environmental Mutagens and Carcinogenesis (ICPEMC) (Obe and Anderson, 1987). No conclusion was reached about the effects of ethanol in relation to genetic damage. In 1995, the UK Department of Health's Committee on Mutagenesis of Chemicals in Food, Consumer Products and the Environment reviewed the evidence for the mutagenecity of ethanol, acetaldehyde and alcoholic beverages. The Committee agreed that the consumption of alcoholic beverages does not present any significant concern with respect to their mutagenic potential. In 2001, Phillips and Jenkinson (Phillips and Jenkinson, 2001) made a review of the available information on the genotoxicity of ethanol, concluding that the data derived from studies using standard genotoxicity methods are incomplete. They reported that there is clear evidence that ethanol is not a bacterial or mammalian mutagen, but the results of some in vivo rodent assays are conflicting. The reported tests for chromosome aberrations in vivo are all negative, a minority of micronucleus tests have given positive results, dominant lethal assays are divided between positive and negative, and there is some limited evidence that high doses of ethanol can induce sister chromatid exchanges (SCE) and aneunogenic effects. The present study investigated the genotoxic potential of ethanol by using long-term exposure protocols to simulate chronic alcoholism in a mouse micronucleus bone marrow test and a mouse dominant lethal mutation assay. Ethanol (CAS N° 6417-5) was obtained from Merck Chemical Co. (Germany). (normochromatic erythrocytes) in 200 total erythrocytes. The results were analyzed statistically by the Mann-Whitney U test, with the level of significance set at a = 0.05. The results were analyzed statistically by the student's t test, with the level of significance set at a = 0.05. Table I shows the micronucleus bone marrow test results. There were no significant increases in induced MNPCEs at any of the ethanol doses (5, 10, or 15% v/v) as compared to the 5-week-old control group. In addition, no differences were observed among the three doses. However, there were significant differences in induced MN between the two control groups, 2.7 ± 1.2 in 5-week-old mice and 6.5 ± 3.0 in 38-week-old mice. As well, the MN frequencies observed in the three ethanol treated groups were all significantly lower than the values observed in the 38-week-old control group. The PCE/NCE ratio was within the normal range (>0.1) for both the treatment and control groups, showing no cytotoxic effect of ethanol ingestion on the cell population. Dominant lethal mutation results are summarized in Table II. The number of total implants per pregnant female is similar for both ethanol doses, and significantly lower than the number observed in the control group. The mean numbers of living embryos per pregnant female also decreased in both ethanol treated groups, but not to statistically significant levels. No differences were observed for the mean number of dead implants, and the percentage of DLM was low and similar for both ethanol doses. Alcohol abuse greatly increases the risk of different malignancies, including cancer, but the mechanisms by which ethanol could be a carcinogenic or co-carcinogenic agent remain unknown. The available data from studies on ethanol using standard genotoxicity methods are incomplete and inconclusive (Phillips and Jenkinson, 2001). Nevertheless, some studies have shown that chronic alcoholism may cause chromosome damage in humans, such as chromosome aberrations in peripheral blood lymphocytes (Burim et al., 2004), centromere positive MN in lymphocytes (Maffei et al., 2000), or micronuclei in tongue cells (de Almeida et al., 2002), suggesting a relationship between excessive consumption of ethanol-containing beverages and some degree of genotoxicity. On the other hand, the reports for chromosomal aberrations in vivo, designed to model the effects of alcoholism in animals, were all negative. Ethanol showed no effect on micronucleous incidence in rat bone marrow, when ethanol was administered in drinking water at 5% for 10-30 days (Balansky et al., 1993) or at 10% and 20% for 3 to 7 weeks (Tates et al., 1980). As well, a non-significant increase in chromosomal aberration frequency was observed at 20% of ethanol administered for 30 days (Tavares et al., 2001). These negative results could be the consequence of the short exposure time period (30 days), or the small number of animals (Tates et al., 1980). However, if ethanol per se is neither carcinogenic nor mutagenic, it could act as an enhancer for carcinogenicity. In this way it has been suggested that the ability of ethanol to induce CYP2E1 (Guegerich et al., 1994) could be the mechanistic basis of ethanol for enhancement of genotoxicity and carcinogenicity in mixtures containing carcinogens, such as alcoholic beverages (which contain urethane, and probably other known carcinogens). In support of this suggestion, alcoholic beverages, such as tequila and brandy, were demonstrated to be more genotoxic with the sister chromatid exchange test in mouse bone marrow cells than was ethanol itself (Pina Calva and Madrigal-Bujaidar, 1993). In this work, we investigated the possible genotoxic effects of chronic ethanol exposure, so mice were drinking ethanol for a longer period of time than that used in the other cited in vivo ethanol studies. In the mouse bone marrow micronucleus assay (Table I), we observed that all ethanol doses tested did not increase the MNEPC frequency as compared to that in control animals. Because it has been reported that the MNEPC frequency increases in mice with age (Sato, 1995, Dass et al., 1997), we used two control groups, one 5 weeks old, the age at which the treated mice began drinking ethanol, and the other 38 weeks old, the age at which the treated mice were killed after drinking ethanol. Surprisingly, we observed that the MNEPC frequency was significantly lower in the three ethanol-treated groups compared to the 38-week-old control group, suggesting an ethanol protective effect against genotoxic damage caused by aging. This low MN frequency observed in our experiment could not be ascribed to an ethanol cytotoxicity effect, because the EPC/ENC ratio is within the normal range (> 0.1) in all of the treated and control animals (Table I). Ethanol has previously been reported as a genotoxic protective agent. 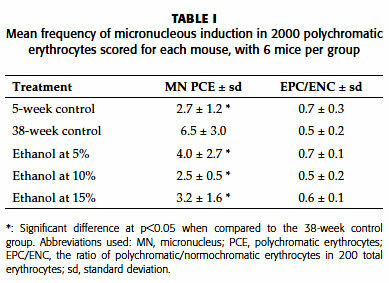 Different injected ethanol doses have been shown to reduce the induction of mouse MNEPC by urethane (Choy et al., 1995). The same authors also demonstrated that ethanol delays urethane genotoxicity for 12 hours (Choy et al., 1996). Other authors have reported a radioprotective effect of ethanol. The addition of 10 mM ethanol reduced X-ray-induced chromosome aberrations in human lymphocytes in vitro, while ethanol was less effective in protection from carbon-induced chromosome aberrations. Since densely ionizing radiation produces lesions through direct action, while other ionizing radiation, like X-rays or g-rays, induces DNA lesions mostly by indirect action where free radicals play an important role, the authors concluded that ethanol protects DNA from X rays by scavenging hydroxyl (OH) radicals (Monobe and Ando, 2002). The same authors found that in mice that are given 1 ml of 5.5% ethanol orally 30 min before whole body irradiation, chromosome aberrations in spleen cells were significantly reduced by ethanol for g-ray irradiation, but not for carbon-ion irradiation (Monobe et al., 2003). These results may confirm the hypothesis that ethanol acts as a free radical scavenger. In human lymphocytes, ethanol showed a protective effect for hydrogen peroxide-induced DNA damage in vitro (Greenrod and Fenech, 2003), also apparently by acting as a free radical scavenger. The primary site of ethanol absorption is the gastrointestinal tract. Only 2% - 10% of the total ethanol ingested is eliminated by the kidney, and the rest is mainly oxidized in the liver (Lieber, 1997). Ethanol oxidation occurs in three places in hepatocytes, by different pathways: (a) in the cell cytoplasm by alcohol dehydrogenase; (b) in the endoplasmic reticulum by the microsomal ethanol oxidation system (MEOS); and (c) in the peroxisomes by catalase (Burim et al., 2004). Each of these three oxidation processes produces specific metabolites. The first phase of ethanol biotransformation involves its oxidation to acetaldehyde, the main and primary metabolite of ethanol. Acetaldehyde is a highly reactive compound that can interact with DNA, forming DNA adducts of acetaldehyde like those observed in peripheral white blood cells of alcohol abusers (Fang and Vaca, 1995), or DNA strand breaks (Singh and Khan, 1995) and DNA cross-links in cultured human lymphocytes (Blasiak et al., 2000). Thus, the high levels of acetaldehyde accumulated during ethanol metabolism could be responsible for the positive genotoxic effects of ethanol reported in some papers. According to many authors, ethanol does not possess genotoxic potential and the observed ethanol genotoxicity is only due to acetaldehyde. Nevertheless, Kayani and Parry (2010) have shown that both ethanol and acetaldehyde can produce significant increases in MN induction, establishing that ethanol-MN induction is mainly through an aneugenic mechanism, while acetaldehyde does the same through a clastogenic effect. Different factors could regulate the rates of alcohol and acetaldehyde metabolism. One of these factors is alcohol deshydrogenase (ADH) and acetaldehyde deshydrogenase (ALDH) polymorphisms, both enzymes being primarily responsible for the amount of acetaldehyde generated. There could be a relationship between polymorphisms of ethanol-induced metabolism genes and alcoholism (Chen et al., 2009), and an effect has been observed of drinking alcohol and ADH/ALDH polymorphism on DNA damage, as measured by the alkaline comet assay (Weng et al., 2010). Thus, human polymorphisms of these enzymes could explain the different effects of the ethanol consumed by alcoholics. Chronic ethanol consumption leads to its oxidation by MEOS, where P4502E1 is the main component of this system, generating an adaptive increase of ethanol metabolism (Lieber, 1997). This adaptation and/or tolerance to high concentrations of ethanol has been suggested to prevent ethanol that has entered the circulation from reaching excessive levels, so this progressively increasing rate of ethanol clearance from blood could explain the lack of genotoxic effect of chronic ethanol administration in rats (Tavares et al., 2001), as well as our negative results in mice. Furthermore, together with a lack of genotoxic effect, we also observed less genotoxic effects in older mice chronically exposed to ethanol. We suggest this could also be explained by ethanol metabolic pathways. Since oxidative damage of macromolecules plays a significant role in the aging of rodents (Martin et al., 1996) and enzymes involved in free radical detoxification, such as superoxide dismutase and catalase, are known to decrease in the liver and brain of mice with age (Dass et al., 1997), the genotoxic protection effect of ethanol could be due to ethanol acting as a hydroxyl radical scavenger by reducing free radical production. Chronic alcohol consumption could stimulate catalase activity, which is involved in ethanol oxidation, producing an adaptive increase similar to that observed for CYP2E1 activity. This hypothesis could also explain the absence of a synergistic or additive genotoxic effect of ethanol combined with cigarette smoke observed in alcoholic smokers (Burim et al., 2004), and the increase of cells with chromosomal aberrations in chronic alcoholics after 12 months of abstinence in comparison to the frequency at the beginning of an intensive treatment program (Huttner et al., 1999). In germ cells, the dominant lethal mutation assay (Table II) gave no evidence of a significant increase in post-implantation lethality, while a moderate but significant reduction in mean total implants was observed, indicating pre-implantation loss. These results are similar to those reported by Rao et al, who found a significant reduction in mean total implants in a Swiss strain, but not in CBA mice after acute ethanol treatment (Rao et al., 1994). Thus, our results exclude the possibility that chronic ethanol exposure could induce germinal chromosome mutations in mice. Finally, our results show that chronic treatment with ethanol does not induce genotoxic damage in somatic or germinal mouse cells evaluated by the micronucleus or the dominant lethal mutation assays. This suggests that ethanol could have a protective effect on age-related genotoxic damage, presumably due to free radical scavenging by ethanol, although further studies are required to confirm this effect and to elucidate the underlying mechanism. Received: June 1, 2011. In revised form: September 13, 2011. Accepted: September 14, 2011.